Gluten-Free diners in Kansas City now have another terrific option for a meal out: True Food Kitchen on the Country Club Plaza. I’ve had a couple of meals at this location now and want to share the positive findings with you. Let me begin by saying if you’ve followed my site for long, you know I am not a fan of chain restaurants. They often lack the training or ability to modify meals for their guests with food intolerances or allergies. True Food is a rare exception to this. I’ve written about the Denver location here. I may have had three meals in two days at a True Food while working out of town. The food is good, wholesome and hearty. And I trust their protocol for safely preparing a gluten-free meal. *The aforementioned statement on the menu and website: Important Information About Our Menu: Please be aware that our restaurants use gluten and ingredients that contain all the major FDA allergens (peanuts, tree nuts, eggs, fish, shellfish, milk, soy and wheat). Our restaurants have shared cooking and preparation areas and the possibility exists for food items to come into contact with other food products. Due to these circumstances, we are unable to guarantee that any menu item can be completely free of allergens. 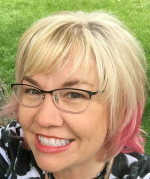 In addition, while effort is made to keep our product information current and as complete as possible, it is possible that ingredient changes and substitutions may occur due to differences in regional suppliers, recipe revisions, preparation techniques, and/or the season of the year. Before placing your order, please inform your server if someone in your party has a food allergy or a special dietary need and we will do our best to make accommodations. 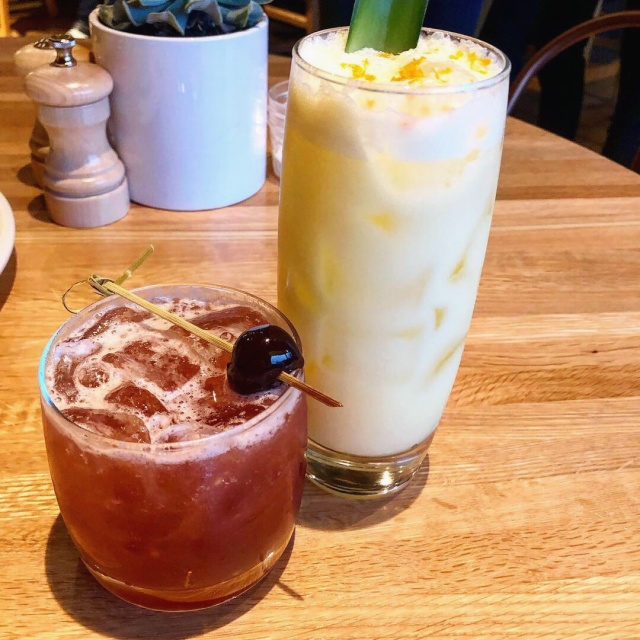 On our first visit, within the first week the Kansas City location was open, we indulged in cocktails. I had the Citrus Colada, my favorite fella had the Cherry Bourbon Sour. The Citrus Colada is brunch-worthy to me! 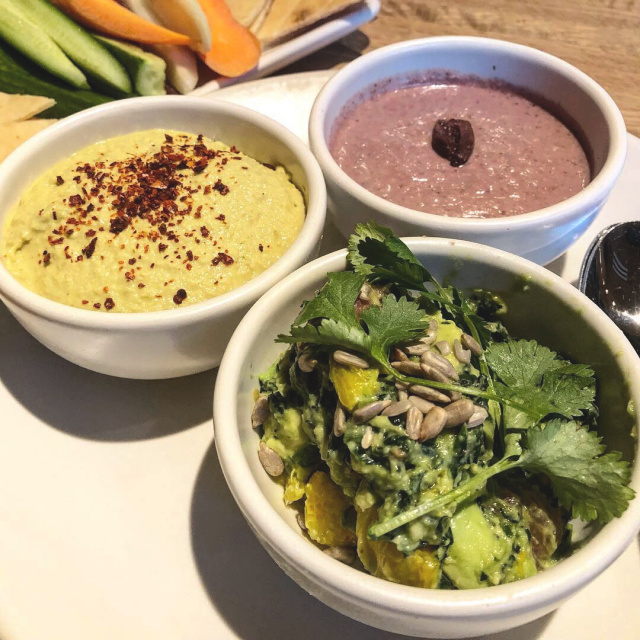 We ordered the For the Table starter: kale guacamole, herb hummus and black olive dip with vegetables and gluten-free pita. The kale guacamole has a bit of grapefruit mixed in, the perfect bit of tangy. The hummus is smooth, creamy, a tinge of bitter from tahini. The black olive dip was my favorite of the three. 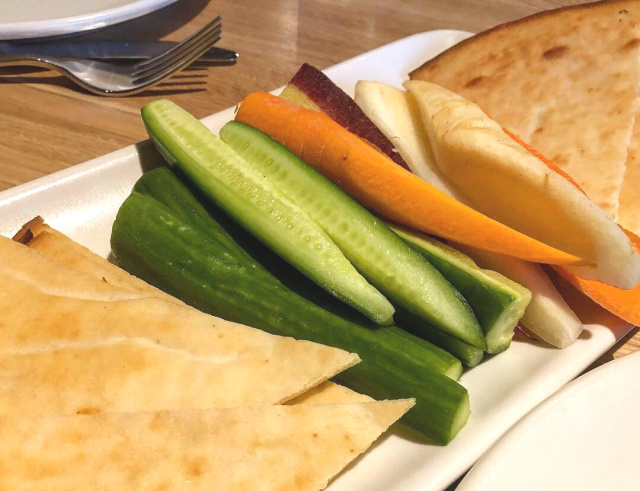 We had more than enough dip to go with the vegetables and gluten-free pita. 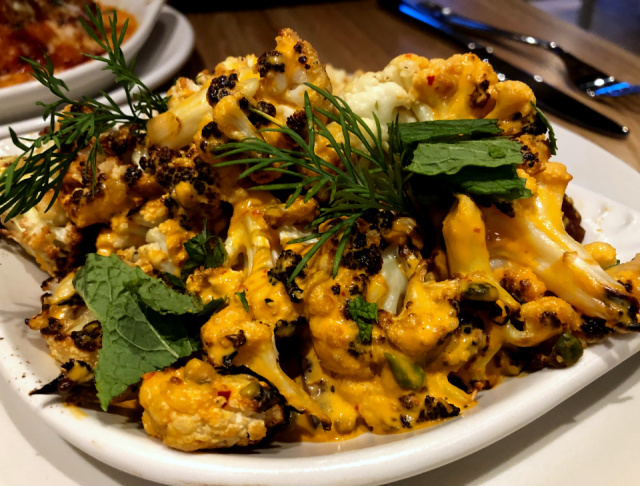 On another visit, I had a favorite that I’ve enjoyed at other True Food locations, the Charred Cauliflower. It has a harissa tahini sauce, dill, mint, medjool dates and pistachios. It’s a shareable dish, but I’d like to make it an entree. Slightly spicy, balanced with the cooling mint and dill. Moving on to entrees, my absolutely favorite dish at True Food Kitchen is the Spaghetti Squash Casserole. 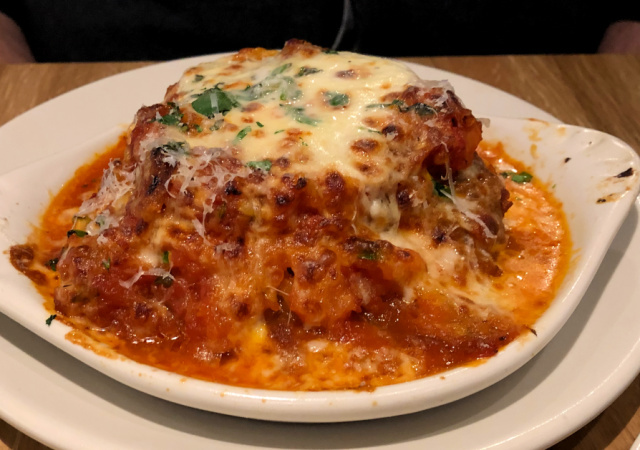 Beyond the obvious spaghetti squash, it has caramelized onions, a bit of zucchini, DiNapoli tomatoes and is topped with fresh mozzarella that is melty and blistered. 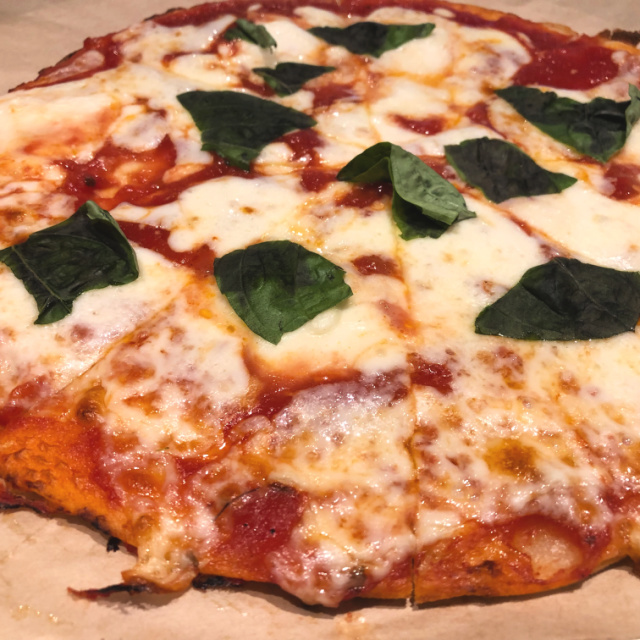 Pizza is another great gluten-free choice at True Food Kitchen. Using a crust from Venice Bakery, most pizza options are topped with crushed tomatoes instead of a sauce, a nod to the Neapolitan pizza style. Dairy-free, vegan and vegetarian options are available. I like the Margherita pizza best. I’ve also enjoyed the Korean Noodle Bowl. 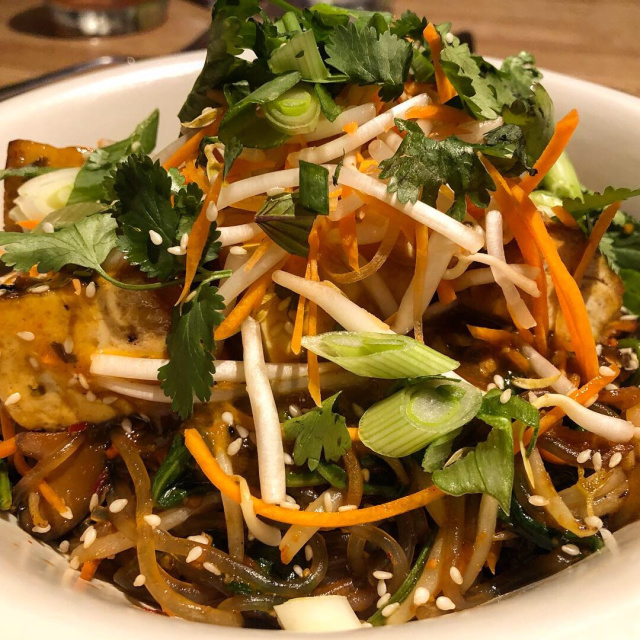 With sweet potato glass noodles, pickled shiitake, spinach, heirloom carrot, bean sprout, toasted sesame and the addition of tofu (chicken, grass-fed steak, shrimp and salmon are also options), this dish is plentiful. Prepare to have leftovers! This is the spiciest dish I have had at True Food Kitchen. Hoping it stays on the seasonal menu long enough for me to enjoy it again. Dessert. I have to admit I’ve been eating less than half of an entree, bringing home leftovers so my favorite fella and I can split a dessert. 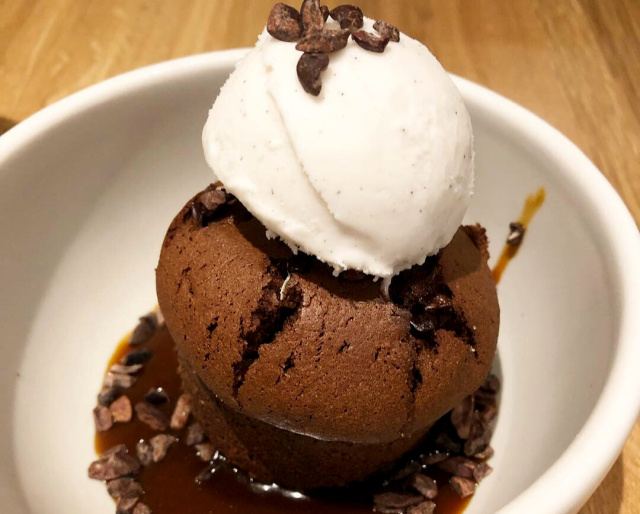 We’ve been indulging in the Flourless Chocolate cake, topped with caramel sauce, almond, vanilla ice cream and a generous sprinkling of cacao nibs. It’s the perfect size to share after a plentiful meal. 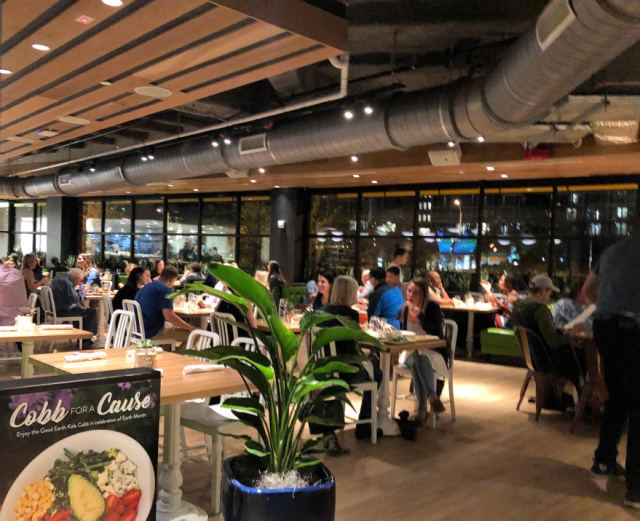 The Kansas City location of True Food Kitchen is located at 4749 Pennsylvania Avenue on the Country Club Plaza, a walkable shopping and dining area 4 miles south of downtown. Buildings were inspired by Seville, Spain. Parking at no charge is available in parking garages and streetside. 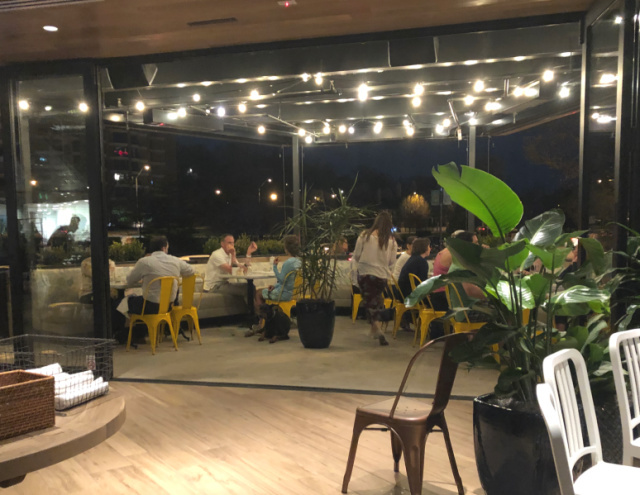 There is a bit of covered, outdoor seating at True Food Kitchen and plentiful indoor seating. The I Ate Here series is not intended as a restaurant review, rather a summary of my experience dining out. * Menu prices, items and ingredients featured were current at the time of writing. Please read the menu carefully and ask for assistance in ordering if you have dietary restrictions. It’s a good idea to call ahead and let the restaurant know of your food needs. It is imperative you ask the necessary questions every time you dine out! *Writing bad reviews doesn’t feel good. Only in extreme cases (a total of two in nine years) where gluten has been apparent in my food or the handling of my food restrictions was of great concern do I share anything less than a recommendation. I’d rather share a good recommendation with you. I hope that’s what you are looking for anyway, recommendations on where to dine and fun places to visits in your travels. Thanks for understanding.